Looking for the latest men's pants? Here you'll find the latest arrivals, the classics and the bestsellers. Every man needs a good pair or two of men's pants - they're a classic wardrobe basic. A black pair, a blue pair, and a grey pair are must-haves. Discover the different styles, and step out of your comfort zone once in a while. You might be surprised as to what you'll find! 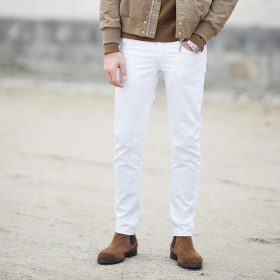 Add a pair of sneakers for a casual look or a pair of formal shoes for a dressed up vibe.